Horizontal slat blinds are good option for metal doors because they come in a variety of styles, colors and materials that will most likely blend in with the surroundings and fit on a door. 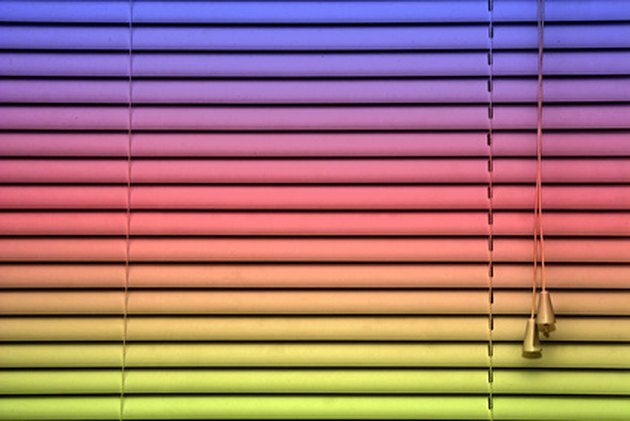 The blinds should be 2 inches wider than the glass in the window and it should be 2 inches taller than the window to make sure it overlaps the glass. It is possible to install blinds on metal doors with a few materials. Mount the brackets 2 inches above the window and use a measuring tape for adequate placement. Hold the brackets against the door and use a pencil to mark the screw holes on the door. Make sure the bracket marks are level with each other and use a level to determine this. Align one bracket up against the marks you made with one hand and with the other hand, use a drill to attach the brackets with self-tapping screws. These screws drill their own hole and pilot holes are unnecessary. Make sure the brackets fit tight against the door. Slide the head rail of the blinds into the brackets. The head rail or long metal piece should fit snugly in the grooves of the brackets. Check that the blinds work correctly on the door and do not get in the way of the door opening and closing. Attach the valance over the head rail by lining it up with the valance clips and it should snap into place. Dianne Christensen-Hermance is an accomplished journalist with more than 10 years experience in writing news and feature articles for newspapers. She is a freelance writer for The Muskegon Chronicle in Muskegon, MI, and Demand Studios. She has a Bachelor of Science degree in journalism from Grand Valley State University.